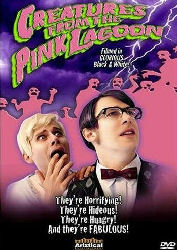 A campy, brainy treat for you – one of the few gay zombie films available to scare you in multiple ways. Creatures from the Pink Lagoon might be zombified by the local chemical plant or who knows, maybe even the nearby cruisy rest stop! The story: In 1967, a chemical plant near a discreet roadside restroom causes an outbreak of gay zombies. At a near by beach cottage a group of best friends must fight off the undead. The story is pretty much what you’d expect from a basic zombie film, but this one has some camp that makes it funny as it makes fun of itself. There are some fun characters as long as you don’t take any of them too seriously. I think one of the best is Randall who is the eternally glum yet sharp tongued (and sharp witted) queen of the bunch. I think most of the great lines in the movie were reserved for him. Cliches are a dime a dozen in Creatures, but it’s meant to be that way. Nasty cologne, birthday dildos, Judy Garland.. they’re all there. If there is a theme here it’s that cruising at rest stops, especially near chemical plants, will get you killed. Fooling around on your boyfriend pretty much doubles your chances of becoming a zombie. I think the features on the DVD were just as good as the movie as they depict a fun and dedicated cast and crew who put this all together. It’s seriously low-budget, but for 60 minutes of campy gay horror, it’s worth a quick watch for a spooky holiday. I had seen this movie years ago, and strangely found myself looking forward to watching it again this week.